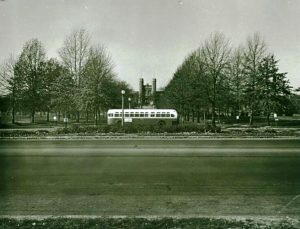 Today’s photo shows a bus moving southbound on Skinker Boulevard past Washington University’s Brookings Hall on November 29, 1953. According to the Missouri History Museum, Brookings Hall was one of the first buildings constructed when Washington University relocated from downtown to its new campus off Skinker Boulevard. It was built in 1901 and named for Robert S. Brookings, a president of the board of trustees who was instrumental in the construction of the new campus and the acquisition and expansion of the medical school. The first buildings on the new campus were leased to the Lousiana Purchase Exposition Company during the World’s Fair. Revenue generated from the rental was used to fund further construction on the new campus. Construction at Wash U – some things never change. That’s probably a 16 CITY LIMITS bus. Notice the nice center median where the streetcar tracks for the 04 CLAYTON and the 16 CITY LIMITS streetcars ran. Now the median is gone for more lanes for the cars, bumper to bumper!